I would love to take credit for this sweet treat, but I actually found the article in Parenting Magazine a few years back. 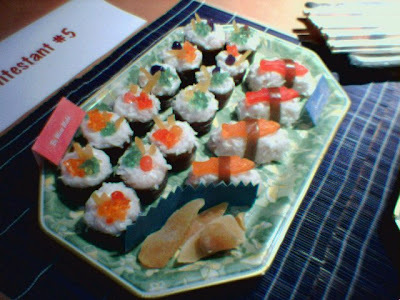 The idea is "sushi" composed of a mini cupcakes, coconut frosting, fruit roll-ups & assorted candied toppings to simulate the fish. Not only were they fun to make, but they made quite the conversation piece at the office party (and a grand prize to boot)!